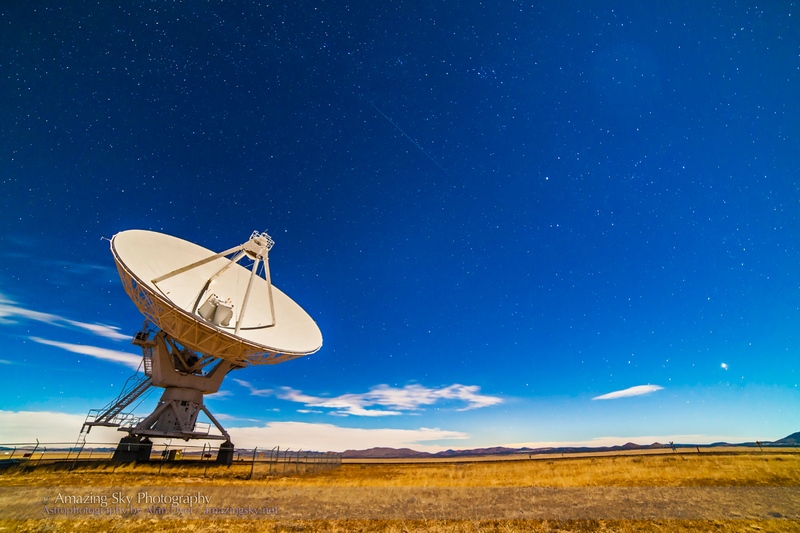 A Geminid meteor in the moonlight streaks over a dish of the Very Large Array. 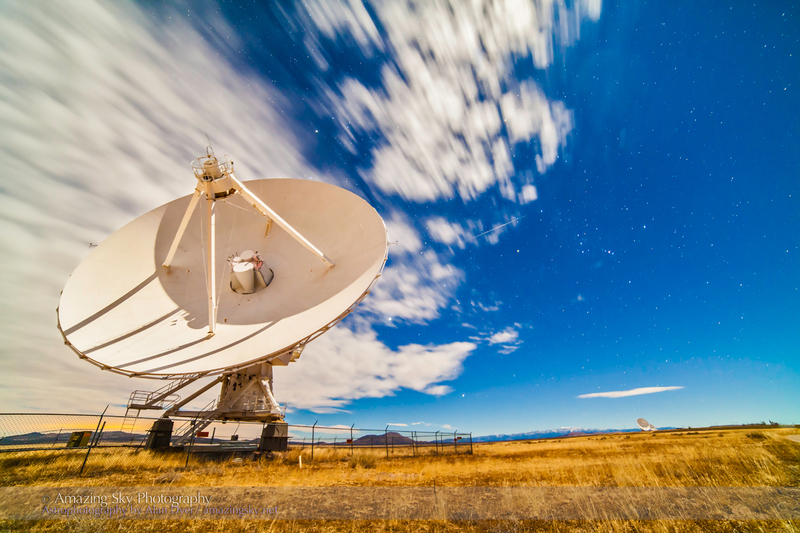 Tonight I was out at the VLA, the iconic radio telescope array on the high desert Plains of San Agustin in central New Mexico. Over three hours I shot 325 frames for a time-lapse movie, hoping that a few would “catch a falling star” or two. Tonight was peak night for the annual Geminid meteor shower so the chances were better than normal. 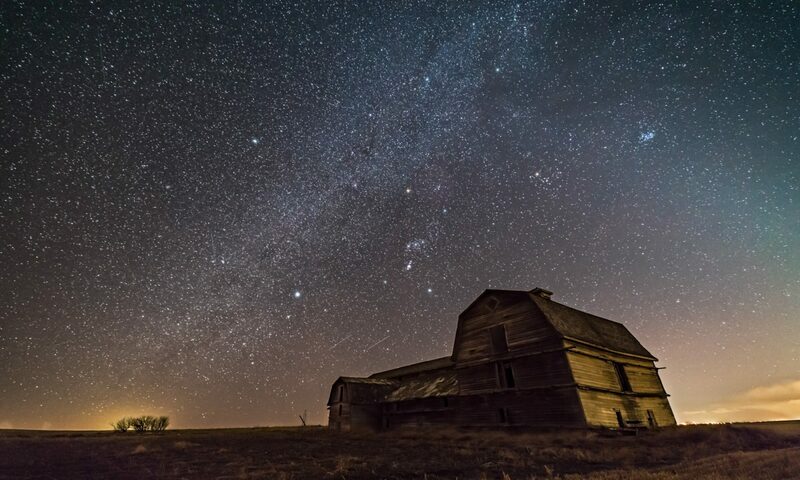 The Geminids are one of the best performing meteor showers of the year. Despite the peak occurring in the evening, conditions weren’t ideal. Light from the gibbous Moon lit the landscape nicely but did wash out many meteors. Of course, I just wanted some bright ones anyway! Also, clouds drifted in and out all evening – mostly in! At top, you can see a faint Geminid meteor shooting up from Gemini the twins, visible rising at lower right, with Jupiter (now in Gemini) marking the constellation’s location. In this image I moved the camera, but the array was also now pointed at a new target in the sky so the dishes were turned to look west. This shot captures another faint-ish Geminid streaking toward Orion, just right of centre. I didn’t nab the grand and brilliant meteor I had hoped for but it was a wonderful moonlit evening under the stars, watching the dishes dance the night away. Astrophotographers have to be an optimistic group given that so much work depends on the local conditions. Your photos are always beautiful and your commentary informative. I feel like I am taking a course in both astronomy and in photography (and from Spain, a little history, too.) Thanks, Alan. Thanks Deborah – always great to hear my photos inspire and educate. Thanks for looking and reading. Clear skies!